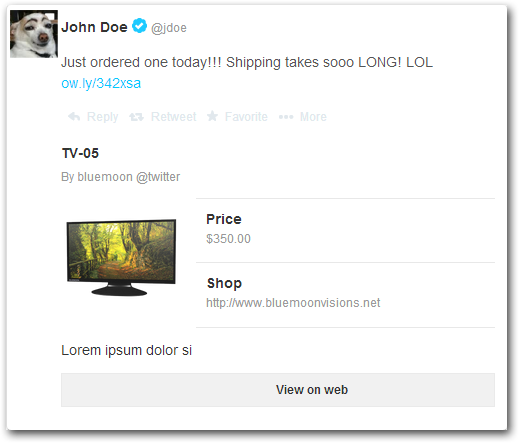 How do I add Twitter Card META Tags to my Products? Twitter Cards allow you to append media such as product images and pricing information to tweets about your products. This can be a great way to represent your items on Twitter and (hopefully) drive sales! So How do I add the meta tags to my store? The basic process of using Twitter Cards for your products involves adding special meta tags to your products to prepare them for their individual Twitter Cards. Fortunately, 3dcart makes this quite easy! At the end of the OG tags already in place, add the following. Save your SEO Tools page. The actual generation and approval of Twitter Cards is something you will need to do through your Twitter account. Each card is uniquely created in order to provide tracking and analytical information to you, so you will be required to create one for each product that you'd like to use it with. Please also keep in mind that there is also an approval process done by Twitter for each submitted card. Again, please refer to Twitter's documentation regarding Twitter Cards for more information.